We're extending brunch to Monday this Labor Day Weekend! Our 20-ingredient Bloody Mary Bar & Mimosa Kits with Fresh Juices will prep you for the return to work on Tuesday while Eric Ortiz of Rendition performs live acoustic music to help you enjoy your extended weekend. Have Labor Day off? 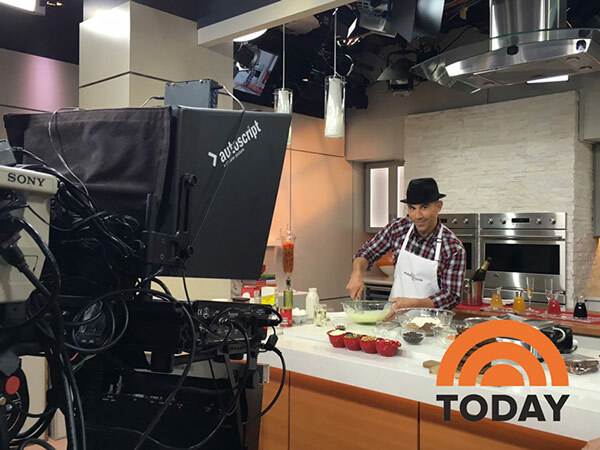 Tune in to the TODAY Show at 10:30am to catch our CEO Billy Dec! Watch as he creates more unique dishes with the TODAY Show crew in New York! Today, Michael Botticelli, Director of National Drug Control Policy (ONDCP), announced $85.9 million in grants for 698 Drug-Free Communities (DFC) Support Programs across the country. The grants will provide funding to local community coalitions for preventing youth substance use including prescription drugs, marijuana, tobacco, and alcohol. DFC’s 2014 National Evaluation Report showed a significant decrease in past-30-day use of prescription drugs among youth in DFC communities. The report also found a significant decrease in past-30-day use between the first and most recent data reports for alcohol, tobacco, and marijuana use among middle school and high school youth in DFC communities. Prescription drug misuse prevention is one of the core measures of effectiveness for local DFC coalitions, and coalitions nationwide have led innovative opioid prevention initiatives. Recognizing that local problems need local solutions, DFC-funded coalitions engage multiple sectors of the community and employ a variety of environmental strategies to address local drug problems. Coalitions are comprised of community leaders, parents, youth, teachers, religious and fraternal organizations, health care and business professionals, law enforcement, and media. By involving the community in a solution-oriented approach, DFC also helps those youth at risk for substance use recognize the majority of our Nation’s youth choose not to use drugs. Additionally, DFC-funded communities have proven to be more effective in addressing these complex social issues and have demonstrated an increase in positive outcomes over communities that do not have DFC’s. The Administration’s drug policy is based on a balanced public health and public safety approach. This approach is built upon the latest scientific research demonstrating that addiction is a chronic disease of the brain that can be successfully prevented and treated, and from which one can recover. The Administration has directed Federal agencies to expand community-based efforts to prevent drug use before it begins, empower healthcare workers to intervene early at the first signs of a substance use disorder, expand access to treatment for those who need it, support the millions of Americans in recovery, and pursue “smart on crime” approaches to drug enforcement. The President has made clear that addressing the prescription opioid and heroin epidemic is a priority for his Administration and has called for $1.1 billion in new funding for States to help expand access to treatment. While Federal agencies have been using their authority to take every available action they can, Congress needs to take action on what is most urgently needed now – additional funding to make lifesaving treatment available to everyone who seeks it. 1 SAMHSA. Results from the 2014 National Survey on Drug Use and Health: Detailed Tables (September 2015) available here: http://www.samhsa.gov/data/sites/default/files/NSDUH-DetTabs2014/NSDUH-DetTabs2014.pdf. 2 University of Michigan. Monitoring the Future Study (December 2015) available here: http://monitoringthefuture.org/pubs/monographs/mtf-overview2015.pdf. 3 University of Michigan. Monitoring the Future Study (December 2015) available here: http://monitoringthefuture.org/pubs/monographs/mtf-overview2015.pdf. Jerry Uelsmann was the 2015 Lucie Honoree for the Achievement in Fine Art Photography Award. "Untitled 1976" and "Untitled 1982" (shown above) are two poster editions designed with Jerry's photographs and now available in the Lucie Editions collection. Melvin Sokolsky, David Hume Kennerly, Barton Silverman, Pedro Meyer, John Biever, Tim Street-Porter, Phil Borges, Nancy McGirr, Douglas Kirkland, Steve McCurry, Reza, Kenro Izu, Gene Trindl, Bob Willoughby, Lee Tanner, Erwin Olaf, Antonin Kratochvil, and Marvin E. Newman. Win a $100 Amazon Gift Card from Wizard World!